Good morning and happy Friday!!!! Do you know what this means? Yep, tomorrow I begin my holiday shopping. I am super excited and can hardly wait. It has been a very busy month for me and unfortunately I have had no time to get out sooner to do it. We are more than halfway through December already and I think this is the first time I have stamped in a few weeks. January is fast approaching and with it comes the new Mini catalogue which means fab new products. Just to whet your appetite I am sharing one of my creations today using some (okay, quite a few) new products from the new Mini. I have to say.... I am SO excited about this one. Everything in it is incredible. So, for todays card, I used a new set coming out called Vintage Vogue. I began by stamping my image with Rose Red ink onto Whisper White cardstock. I layered my image on some Taken with Teal cardstock to make it pop. I grabbed my Mat Pack and added some "stitching" around the edges (this goes very well with the tiny dots on my patterned paper) Next I grabbed the beautiful new Stitched Felt and selected a flower, a leaf and a center dot for the middle of my flower. I attached them beside my image using glue dots. Oohhhh, so pretty already. For the base of my card I used Whisper White cardstock and placed a layer of Old Olive cardstock over top. Then I added a layer of... wait for it.... yep, some new Designer paper called Sweet Pea. You have no idea how gorgeous the paper is in this package. I've liked the papers in the past but this WOW and ... there are 48 sheets of paper in this particular pack. It is better than any paper I've seen from competitors in the stores and trust me, I love patterned paper and I am always flipping through paper packs in stores but if only a few tickle my fancy, I won't buy it. This one however has blown me away. I've just begun to make some cards with it and already I'm thinking I may need to buy another pack LOL. Okay enough drooling on my part over the paper. So I obviously attached this to my card base and I finished the card by popping up my image with pop dots. I have been so card deprived lately that when I got into my stamping room last night, I whipped this up in about 15 minutes, maybe even less. I was so thrilled to just be able to create that this card flowed from me. I hope you all have a wonderful weekend and I will actually be back Monday with another post for you. OMG - you're right - what beautiful paper!! that was the first thought I had as soon as I saw the card! Also, can't wait to see the rest of that stamp set! Wow! 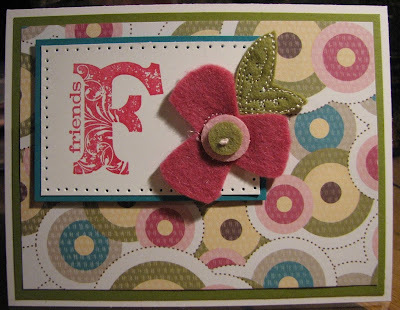 What a great stamp, and that stitched felt...SWOON!!! This is beautiful Margaret!